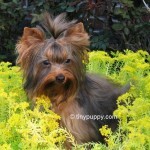 This Beautiful Micro Golden Yorkie Boy is Nibbles. You see, Nibbles gets his name faithfully. Nibble’s Mommy (who I might add is a very good Mommy) was trying to protect him when he was a tiny tiny baby. 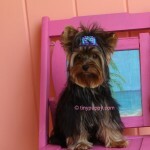 Another Yorkie Mama tried to take him home with her so he ended up in the midst of a brawl. So we named him Nibbles. Nibbles little ear has a nibble taken out of it. He is so beautiful and x-tra tiny, I just couldn’t resist offering him to you. Nibbles is so playful and fun. 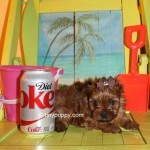 He is a very happy puppy and makes everyone that sees him smile.. Nibbles is just 1.8 lb at 9 weeks of age. He’s our little doll. 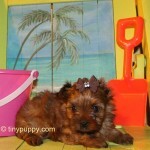 This is your chance to own that special tiny Yorkie.